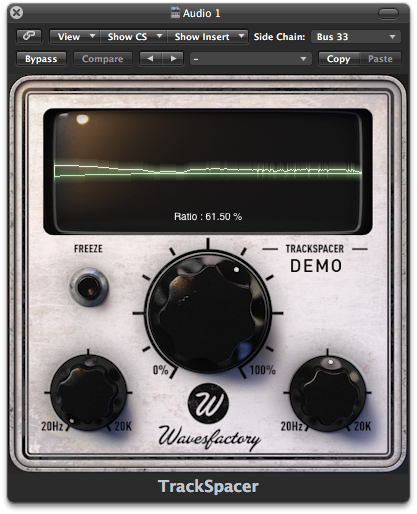 TrackSpacer is a new plugin from WavesFactory that helps the user create space in the mix when two sounds are fighting for the same sonic space by using multiband dynamic eq instead of compression (such as the kick and bass occupying the same frequencies.) I did a quick demo with some drum loops where there was some buildup in the lower mids and bass. With some quick tweaking I was able to fix the issue. The actual settings I used are in the pic above. "TrackSpacer....creates space in the mix for an instrument, voice, or other audio by performing automatic, multiband equalization on a channel. In real-time it analyzes the audio frequency content in a track/bus via sidechain, and applies an intelligent 32-band EQ to subtract those frequencies from the channel/bus where TrackSpacer is inserted. In other words, it gives room or space to a certain track by reducing its frequencies on another track in real time." Filters: Maybe you only want TrackSpacer to duck a certain range of frequencies and leave the other as they are, you can control that with these hi pass and low pass filters. Freeze: This button makes the EQ settings permament. Screen Display: You can see the original frequencies of the sidechain (white curve) and the EQ curve applied by TrackSpacer (green curve) in real time.